Making it to the top of one of the Sossusvlei dunes is certainly worthy of bragging rights ”“ it might look easy, but that soft sand soon gives way under your feet making each step you take feel like you are going backwards. Big Daddy is the tallest dune in the Sossusvlei area and stands at a towering 325m, way higher than the surrounding dunes. Carry plenty of water and then once you make it to the top enjoy the magnificent views of Dead Vlei below, you will have earned it! It can take between 1.5 and 2 hours to summit so make sure you are prepared, we recommend starting early as it will get hotter as the day progresses. It may take a long time to reach the top but your descent will take just minutes as you ”˜run’ down the dune. Dune 45 is a popular choice for a climb. It gets its name as it is 45km from the Sesriem gate. As one of the closest to the entrance and easiest to get to, it is one of the most climbed and also most photographed of dunes. Compared to Big Daddy this is a small dune at only 170m high, but don’t let this fool you, it’s always a challenge and it has a sneaky surprise, once you think you’ve reached the summit, there’s a dip before the actual top. Arrive early and you can see the sunrise over Dune Valley, a view to remember. One thing we can be certain of is that the way down a dune is much easier and quicker than the way up. Try to keep to the shady side tough, as the sand will be cooler. Our top tips are to start early, carry plenty of water and take a camera for capturing the awe-inspiring scenery. There are many dunes to climb, stick to the main ones where it's known to be safe to climb. Dune 45 and Big Daddy are the most coveted. You can climb anytime of year, but we think it best to avoid the hottest months (December, January) and also start your climb as early as possible, the sand soon gets hot as the day heats up. As a self-driver you can make your own way to the dunes, they are signposted, and begin your climb, there will most likely be others attempting it at the same time. Often the nearby lodges organise trips into the park and will stop off while members of the party make the climb. 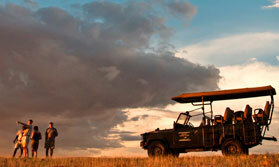 A high quality small group guided holiday travelling by road and air to some of Namibia's highlights.